Availability: Custom Order Item - may take 2-3 weeks for delivery. 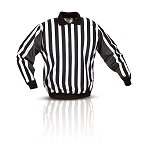 The Referee's Closet is now offering the service to have your nameplate attached to a new jersey. 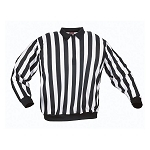 Please note, having The Referee's Closet attach a plate to a new jersey renders that jersey unreturnable except for manufacturer's defect. There are no exchanges or refunds of a jersey for size/fit issues once a plate has been sewn on. 3" white letters sewn onto a 4" black backing. Most plates are 17" long (the backing length does not change for a "short" name unless you specifically request the backing to be trimmed in the order comments section during checkout. Names 10 characters or longer - we suggest either the Narrow Full Block font to keep the plate with 3" letters OR we can use 2" Plain Block letters on a 3" backing. (Unfortunately, the plain block font is not available in a narrow format.) Selecting the standard full or plain block font may result in the nameplate extending into the sleeves of the jersey. Enter the information EXACTLY as you would like it to appear on your Name plate below. Letters only come in upper case with the exception of certain prefixes such as "Mc" , "de" , etc. Please double check your entry as there are ABSOLUTELY NO refunds or cancelations for plates once we order them. 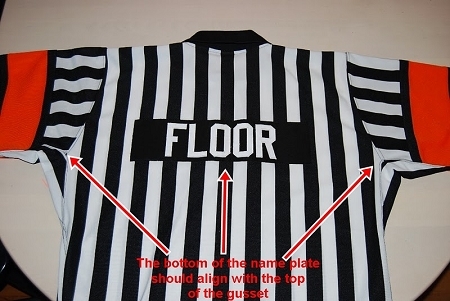 For customers sewing their own plates (or adding a plate to an existing jersey), below is an image showing the proper placement of a nameplate.